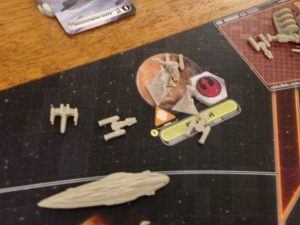 I would love for Rebellion to hit the table more often, but after the few games we have played, my favorite aspect is how close games are. 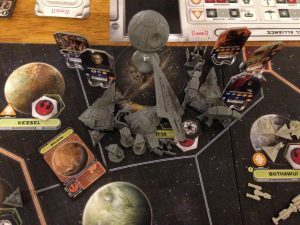 I suppose a lucky Imperial player could blunder their way into the Rebel base in the first round or two, but each game I have played has come down to the wire, with room for either side to win in the last round of the game. 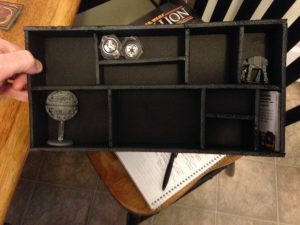 As it had been some time since playing, we used the beginner set up from the learn to play booklet. Here is what happened once we started playing. The game opened quietly, the largest development being a concerted Rebel effort to win Mon Cala. Princess Leia and Mon Mothma made diplomatic appeals, while General Rieekan brought troops to defend their new ally. This acquisition gave the Rebellion access to the Mon Calamari shipyards. The Imperials took advantage of this round. Darth Vader, assisted by Boba Fett, led troops to Kashyyyk, subjagating the Wookiee homeworld and denying resources to the Alliance. Wasting no time, Grand Moff Tarkin launched construction of a second Death Star in the Dagobah system. General Rieekan led a failed Rebel attempt to sabotage Imperial facilities on Corellia. Rieekan himself was detained on suspicion of Rebel activity (in game, this prevented his use on the following round, but was not the same as capturing him). 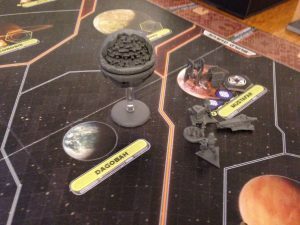 In what became the middle of the game, round 4 was full of political intrigue as well as military action. Han Solo leveraged his friendship with the Wookiees to stifle Tarkin’s efforts at gaining Kashyyyk’s loyalty. Meanwhile the Emperor himself threatened the Core Worlds, gaining loyalty in Alderaan and Cato Neimoidia as they fell in line. General Tagge led troops to Malastare, subjagating the planet. Colonel Yularen invaded the Rebel friendly Naboo system. Naboo was conquered and the attack drew Luke Skywalker out of hiding to command Rebel forces. Boba Fett sprung his trap, capturing Luke until Darth Vader could arrive and freeze Skywalker in carbonite. Obi-Wan Kenobi made a daring rescue of Luke Skywalker, foiling Imperial plans to turn or torture him. Meanwhile the Imperial fleet moved rapidly to several systems in search of the Rebel base. 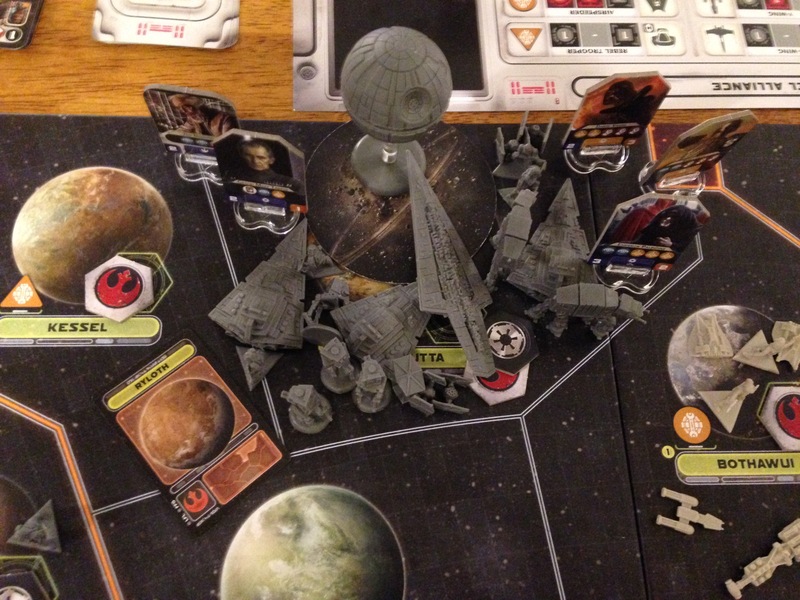 As the Imperial player I had begun to feel I was narrowing down the base location and would soon have victory. The Empire again drew upon Boba Fett’s services as he teamed with General Tagge to capture Han Solo. Solo resisted Imperial efforts to torture the base location out of him. The fleet continued to move quickly from system to system, eliminating possible base locations (this is why Darth Vader is in such a foul mood at the beginning of The Empire Strikes Back). Preparing for the end game. Foiling Imperial efforts to turn Han, Obi-Wan again pulled off a daring rescue with the aid of General Dodonna. The Imperial fleet continued to rule out systems. 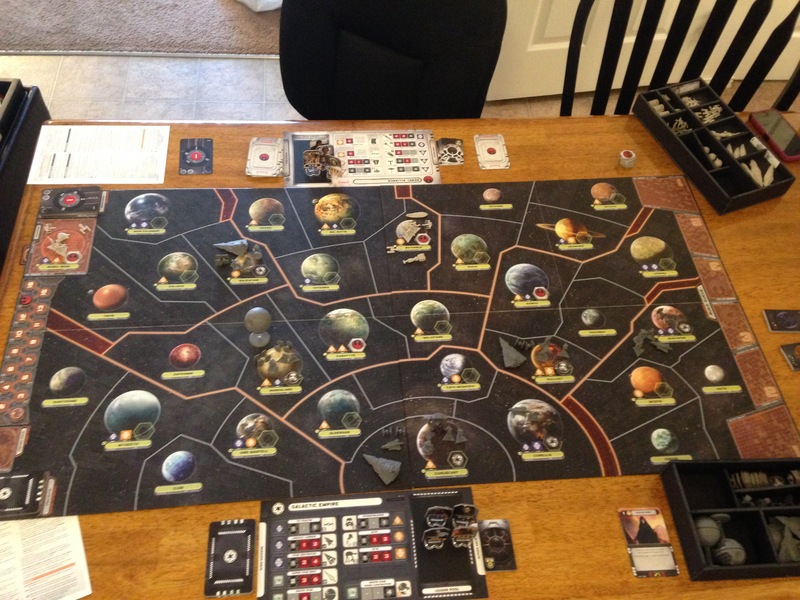 At this point, as the Imperial player, I had narrowed down the location of the rebel base to the neighboring systems of Bothawui and Nal Hutta. In preparation for a climactic battle, several Imperial fleets, and a Death Star converged on Toydaria and Saleucami. As the round concluded, probe droids eliminated Bothawui as the rebel base location. The Rebellion completed an objective which resulted in guaranteeing round 8 would be the final round. With the location of the base almost certainly determined, the Imperials moved quickly to destroy it. 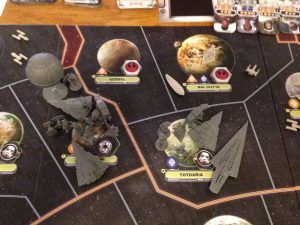 Colonel Yularen merged the 2 large fleets gathered in round 7, moving the Death Star to Toydaria for a quick jump to Nal Hutta. To soften defenses and ensure optimum leadership during the assault, Darth Vader and Boba Fett completed a mission targeting enemy ground forces. With all the pieces in place, Emperor Palpatine himself moved the fleet to Nal Hutta. The rebel base. One system too far to reach. The rebel base was not there. 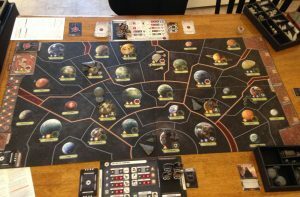 In an absolutely gutting critical error, I had overlooked the Ryloth system, thinking I had ruled it out early on. The battle at Nal Hutta was over very quickly and the planet was subjugated. Without enough Imperial leaders available to move anyone to Ryloth, the game was lost. Tarkin destroyed Nal Hutta with the Death Star anyways. The lone AT-AT not present on the board. great tug of war, with neither side steamrolling the other. 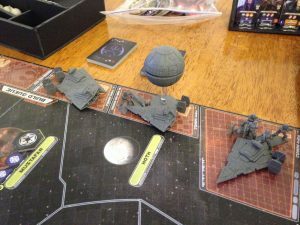 As the Imperial player I felt all powerful, by the final round I had every Imperial unit in the box deployed, save a single AT-AT. That power did me no good in the end. I suppose you could say “(my) overconfidence was (my) weakness”.